I'm a 28-year-old PhD student in Baltimore, MD finishing up a degree in Astrophysics. I've been doing the NYT puzzle everyday for many years now, so it seemed like a natural jump to start writing them, and this puzzle was my first shot at it. The constructors who play with the symmetry and the physical structure of the grid are always my favorite, and I had this idea for a rebus that (I think) I hadn't seen before. Hope to have my name keep showing up every once in a while here. Yet another debut! That make four days in a row, as well as four Thursdays in a row. New voices and new ideas are a great thing. Love this particular idea, BLACK rebus squares helping to take away the perceived ASYMMETRY. (I've grayed out the rebus squares to better illustrate this point.) I saw this idea maybe seven years ago (in a different venue) and thought it was the coolest concept ever! Even though the novelty wasn't there for me this time, I still enjoyed the effect. Some great entries, starting off with the themers. 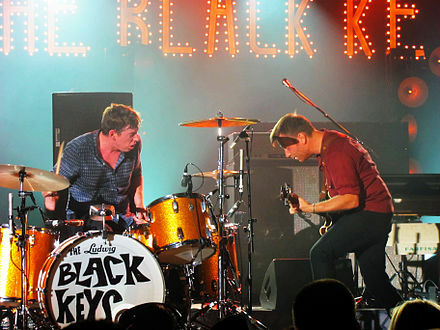 Particularly cool to get a BLACK box in the middle of a phrase, in THE BLACK KEYS. But even BLACK BEAR, which looks so close to BLACK BEARD (there's a crossword theme in there somewhere …), and the finance term IN THE BLACK are awfully fun. Loved TERMINATOR in the fill, too. I hope this factoid — 100% positive rating on Rotten Tomatoes — doesn't prompt crossword trolls to go give it negative ratings. Don't do it, people! Some mid-length MAMMOTH, CARNAGE, SHINTO also added to the quality of my solve. A singular SCRUPLE was a bit odd, but it does have dictionary support. Just a little too much crossword glue for my taste today. I didn't start noticing it until I hit SES / TET, but then I started picking up OLEO (which admittedly some people think is fine), MAL, ARA, MTS. Nothing cringeworthy, but as a whole, just up against my threshold. [Needing salt, maybe] doesn't refer to seasoning, but salt for ICY snow conditions. Nice misdirect in [Shoots in the jungle], making it look like "shoots" is a verb, not a noun, for BAMBOO. Average word length: 5.01, Scrabble score: 284, Scrabble average: 1.55.